I LOVE IT!!! I can't wait to see what Ariella will do with this information... Will she turn me in? Ok, take this... minus the hat, gear, gloves, and scope over eye. 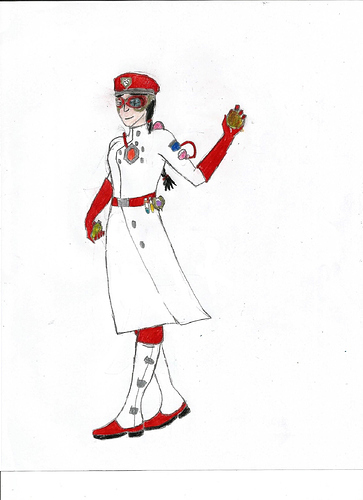 Make the lab-coat light grey, and all the red blue. That's Danria Whyatov.... Vytanni before she was Vytanni. She loves Hot Strawberry-kiwi tea, hot cocoa, and iced tea. Her favorite foods are soft pretzels, chicken Lapsha, and Pelmeni. @Ariella_Newheart this post is all about how INCREDIBLE your story is. I tend to like any story about Aetherlight, (because it's Aetherlight), but yours is truly amazing! It's good enough to be published. Seriously! Your writing has had a lot of thought put into it, and the characters are VERY realistic and interesting. I read some parts a couple times because I liked how they were written! I've recommended it to my sis and my mom to read! Anyway...fangirling over here! I'M LOVNG IT!!! @Iliara_Mustardtop awww thank you so much! That means a lot to me. I've had lots of practice writing, but I still didn't know if anyone outside the circle of my family/irl friends would like my work. The response here on the forums has been very encouraging and amazing. I greatly appreciate all the kind words from you, @Ilayne_Merespark, @Scarlett_Darkhall, @Aislinn_Mollisong1, @Vytanni_Throttlenight, @May_Otterview, and all the others who've taken the time to read through my story and have helped puzzle out my story's future plotline and character desctiptions. Thank you all. Thank you for the kind words! Its my goal to encourage and help people in any way I can!! Wow, the newest account was GREAT @Ariella_Newheart!!! Can't wait to see what happens!! There isn't going to be any new chapter this week, sorry everyone! A lot has been going on lately with me, but hopefully I will be able to proofread another chapter to post by next week. To tide you over until then, here's a sneak peek to Chapter 8, which I have entitled: Remember. Ariella Newheart began to remember. She remembered stories people told about the world when there was no fog. As unbelievable as it sounded, Aethasia had once been fogless. Ariella remembered the legends about bright amethyst mist that swirled and sparkled like starlight. It was bright and pure and full of hope. Once the lifeblood of Aethasia, now it was nothing but a near-forgotten memory. The stories of others had kept the light of Aethasia from completely fading away, and Ariella's soul longed for that light. Her heart was different. It was tainted by the fog and tried to lead her away from the purple light and back into darkness. Only the Scarlet Man can remake and renew one's heart. @Ariella_Newheart So cool, can't wait! Take all the time you need! Hope everything's ok! Lucky just did. So not only him did. Well Lucky's bad, I'm neutral, Scarlet man is good. And it is even represented in the colours. From green to blue to purple! Haha! Interesting, youll have to see what Ariella thinks. WHAT IN THE EVEN ACTUAL AETHASIA?!?! @Ariella_Newheart, that was strange, cool, and completely arbitrary. But, um, I didn't say any of those things. How did you do that? This is a topic for making fake quote's such as. No offense intended to any one in this topic. Love the newest part, Ari!!! I HATE FOG! Nice story! SOOO VERY COOL! Btw, I used some of your inventions, such as the Inspector, for Nikko's story, as he went to both the Junior Academy and the Academy Automicus.